A few articles ago I analyzed the budgets and profits of Mockbuster movies. That got me thinking about what is the profit margin for big studio blockbusters and how does overhead effect the film’s success. This summer there is a flurry of superhero movies. Of course there is a lot of hype with the marketing. I decided to look at the Warner Brothers Studio DC Cinematic Universe and break it down for fun. The first thing I noticed about Wonder Woman is it was cheaper to make than any of the other films. 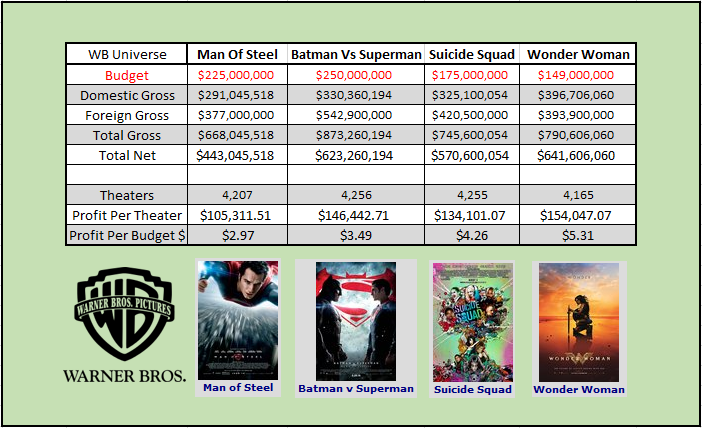 Batman Vs Superman was the most expensive of the bunch; you can almost fit two Wonder Woman budgets per one Bat Vs Supe. Wonder Woman is even playing in less theaters then it’s predecessors. Per theater Wonder Woman is more profitable. When wonder woman is put in the same number of theaters as the other movies the profit of overall totals would crush each of the other movies by a large margin. Wonder Woman is the cheapest movie to produce of the bunch. So much so the gain per dollar spent is $5.31 or 531%. If the budget was the same as the Worlds Finest then the dollar spent would only gain $3.16 or 316%. Every dollar spent is a dollar that has to be earned back before profit. This entry was posted in Added Value, Goal Setting and tagged Blockbuster, Warner Brothers Studio, Wonder Woman. Bookmark the permalink.